Last week, Google was celebrating its birthday. So one by one it was unveiling new things on itself. Started by the google html5 doodle, which was followed by Google Instant; though it left us something to discuss upon. Mainly the SEO factor. You must have seen that the Google Instant feature automatically suggests Keywords which may not be the term you are searching for. I’ve faced this issue with DailyBlogging itself. 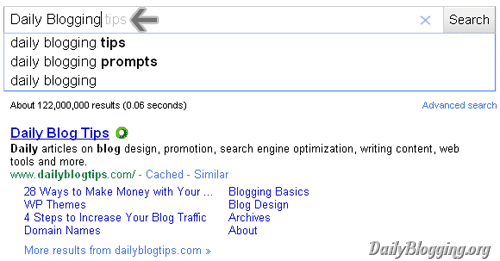 As we all know dailyblogtips is a popular blog & it has a popular keyword in its own domain name (‘daily blog tips’). 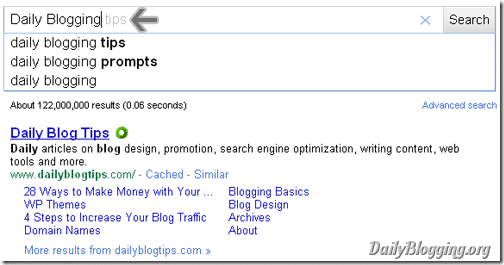 When I typed Daily Blogging; the Autocomplete feature showed the results for ‘daily blogging tips’ relating to dailyblogtips.com. Check the image below. No doubt, one can easily turn off the Keyword AutoComplete feature using the Preferences tab. But for people who prefer using the new feature which facilitates faster surfing, had a small doubt whether it would affect their site’s SEO or not ? Now you can clear your doubts; as Alden DeSoto – a member of Google’s Analytics Team has officially clarified that the Autocomplete feature in Google Instant won’t be affecting the SEO of your site. So this ultimately means that you don’t need to additionally put in your efforts to trick your site/blogs keyword to appear as Autocomplete. Remember, it all depends on the popularity factor (here: the no. of times that particular term has been queried) of a keyword to appear in Autocomplete. Did you think about doing a separate keyword research after Google Instant was live with the Autocomplete feature ? Nope, I don’t have any plan to do a new keyword research now, since I have done that before and I am getting results for my work now. Many webmasters and seo specialists are frustrating for Google instant’s auto completion i think, as you said this post Google providing the option to stop auto completion as per our preference or we can hit search button to perform search after enter particular keyword.. Finally! Someone not claiming that Instant means the sky is falling! Yes SEO will be there because many are still using google.com to search. I agree with your point but Companies have to rethink about the keywords they should optimize and build links for. No man this thing totally affect my site, some days ago after the launch of this factor my organic traffic is dramatically dropped, not only mine, I am reading a blog today earlier they have they same problem as well. hmm..maybe it’s a coincidence, as many bloggers weren’t affected by this. It’s nothing to do with the blogger’s side. It’s the way people search for keywords. That matters~! Nice one. Instant may not work if the connection is too slow. I am looking for a good keyword tool. I have tried niche-bot, SEO Book, and of course Google keyword tool.I am not limiting my search to only free tools. I would be more than willing to pay for the tool if you think it’s really worth the money.So which keyword research tool is the best. I don’t believe in Google instance because it works on cookies only , The best way is Google adwards to find the proper keyword along with traffic and competition. It’s been a couple of years now and it’s true Google instants can produce decent keywords. I tend to use a mixture of Google adwords and google instant keywords. Seems to work for me. Yea I am glad this one didn’t affect anything, i know a few people who owuld have been hurt by it.